Aike Rots’ thesis expands our understanding and offers a critical account of the continuous reinterpretations of religious practice in response to contemporary world issues and associated social movements, namely, in this case, environmentalism. Indeed, together with, for example, the re-discovery of shamanism as “indigenous ecocentrism” (Thomas Karl Alberts, 2015, Shamanism, Discourse, Modernity, Surrey: Ashgate, p. 130), the growing global concern with ecology in the 1980s seems to have also influenced the re-imagining of another so-called “indigenous” religion, Shinto. Rots argues that in addition to the various conceptualizations of Shinto that exist today (more about this in Chapter 5 of the thesis), we should now also count a “Shinto environmentalist paradigm,” which he defines as “the conceptualization of Shinto as an ancient tradition of nature worship, containing important ecological knowledge and solutions for overcoming contemporary environmental problems” (p. 38). A core term in this paradigm is the notion of chinju no mori, or (sacred) shrine forest, which should be familiar to scholars of Japan as it has been used increasingly since the 1990s in relation to not only shrines, but also forest management, landscape conservation, spirituality and even Japanese national identity (p. 253). Rots shows that, perhaps similarly to what has happened with “spirituality” (supirichuariti), another term popular in Japan since the 1990s, chinju no mori’s unclear boundaries and absence of authoritative definition allowed it to be appropriated by different actors (academics, environmentalists, Shinto priests, local community leaders and volunteers) for different purposes (to claim for the uninterrupted ecological continuity of a forest, to identify the allegedly typical landscape of Japan, or to criticize the technological and economic progress of the country), leading to a disparate movement whose promotion of an environmentally-friendly Shinto can tell us a lot about notions of nature and sacred space in contemporary Japan. The thesis is composed of eleven chapters, divided into four parts, and is accompanied by a 9-page glossary of terms, which I found particularly useful when I needed to remind myself of the names of trees mentioned throughout the text. In addition, a map of Japan marking the 41 shrines mentioned throughout the text allows the reader to keep track of the geographical spread of the chinju no mori movement in the country. The first part is composed of three introductory chapters and sets the tone for the rest of Rots’ work. I was immediately taken in by the author’s clear and concise explanations showing full awareness of his stance and knowledge about how to tackle the fundamental issues that all PhD authors need to grapple with: positionality, methodology, and the definition of the core-concepts employed in the thesis. A few examples should suffice to demonstrate the above argument. Noting the essential transdisciplinarity of his background in both Japanese Studies and Religious Studies, Rots uses a combination of historical discourse analysis (informed by Kocku Von Stuckard’s discursive study of religion) and ethnographic field research to approach his data, and sounds particularly convincing (especially to the ears of fellow Japanese Studies specialists like me) when he writes that “transdisciplinarity lies not in the choice of the subject matter, but in the interpretation of that subject matter” (p. 34). The subject matter are, of course, the shrine forests mentioned earlier, but Rots’ transdisciplinary reasoning allows him from the beginning to critically question the use of basic concepts in his study. He agrees, for example, with Timothy Fitzerald and Russel McCutcheon that ‘religion’ is an ideologically charged concept, but follows Peter Beyer in noting that the concept “figures prominently in the contemporary world, if only as an ‘emic’ category” (p.45), deciding thus to use the term, but with caution. Similarly, for “Japan” he notes the problems of essentialization of Japanese culture by scholars writing about Japan (and most famously criticized by Harry Harootunian), but draws from Tessa Morris-Suzuki to argue that Japanese Studies will still have a place in academia as long as scholars conceive of “Japan” as a second-order, historically constructed category (p.48). Finally, in the last section of Chapter 2, Rots draws from his previous arguments to offer a critique of the secularization debate in Japan, focusing particularly on Ian Reader’s thesis (see the special issue of first volume of the Journal of Religion in Japan), which he rejects for being based on observations not related to the decline of religion, but rather to changing political and socio-cultural circumstances that only show that some institutions such as temple Buddhism have not been able to adapt to these changes, whereas others have, such as pilgrimage practices rebranding themselves as “cultural heritage.” Rots thus agrees with the other authors of the first issue of JRJ, namely John Nelson and Mark Mullins, who argue, respectively, that there exist multiple, culturally-specific secularities in contemporary Japan, and that, as N.J. Demerath has also pointed out, these co-exist with processes of sacralization in Japan, which have taken the form of deprivatization, or the “return of rituals and sacred symbols to the public sphere” (p. 65). This type of secularization will become particularly relevant in the last part of the thesis where the author demonstrates how some of the cultural activities of sacred forest conservation projects consist of a religious socialization in disguise. In the final chapter of the first part of the thesis, the author moves to a discussion of “space” and “sacred space,” two notions to which the concept of chinju no mori undoubtedly alludes. For the notion of space, Rots returns to the work of Henri Lefebvre (Henri Lefebvre, 1991 , The Production of Space, Translated by Donald Nicholson-Smith, Malden: Blackwell Publishing), from which he draws four implications: 1) that today “nature” has become a product reproduced in conservation practices, tourist destinations, and advertisements; 2) that spatial practices acquire meaning discursively, while narratives may simultaneously have spatial aspects; 3) that spaces embody and are part of ideologies; 4) that spaces have genealogies and are made of multiple historical layers. Rots then moves on to a review of the notion of “sacred space,” where he notes that Kim Knott (Kim Knott, 2005, The Location of Religion: A Spatial Analysis, London: Equinox Publishing) was the first to have applied Lefebvre’s theory of space to the study of religion (p. 85) to argue that sacred space is contested, while it is also perceived as non-negotiable by those whose discourse sacralizes it. Rots argues that Japanese sacred places have been undergoing two concurrent processes: 1) the heritagisation of worship traditions, by which “sacred” buildings or objects are redefined as “cultural heritage” (prominent examples being those of the World Heritage Site Kumano Sanzan and, as we will later find, the sacred forests of the Grand Shrine of Ise); and 2) the (re)sacralisation of worship places, as demonstrated by the “powerspot boom,” which has seen shrines, temples, and other “sacred places” reframed as places with significant “spiritual power” by mainly non-clergy outsiders such as journalists, local authorities and popular authors. The second part of the thesis, composed of four chapters, offers a description of what the author has called the Shinto environmentalist paradigm (Chapter 6), preceded by critical discussions of the alleged Japanese “love of nature” in Chapter 4, and of the various ahistorical interpretations (i.e. paradigms) of Shinto in Chapter 5, before examining the reasons behind shrine-related environmental advocacy in Chapter 7. Drawing on Anna Tsing’s work (Anna Lowenhaupt Tsing, 2005, Friction: An Ethnography of Global Connection, Princeton: Princeton University Press), Rots notes that, like “God,” “nature” is another universal concept which has often escaped historically and politically-sensitive analysis, even though in Japan “shizen is similar to shūkyō: an existing Chinese concept that was rediscovered and reemployed as a translation of a modern epistemic category in Meiji-period Japan” (p. 105). The author shows that it was in the work of 18th century nativist scholar Motoori Norinaga that we first find the association of an appreciation of nature’s beauty and harmony with nationalist assertions of Japanese divine superiority (p. 109), a claim of Japanese uniqueness that was to be further perpetuated in the works of modern thinkers, such as philosopher Watsuji Tetsurō. What is particularly interesting in this string of thought, however, is that it was reinforced by postwar discourse stemming from an influential 1967 Science article by Lynn White, Jr. (“The Historical Roots of our Ecological Crisis”), which claims that “Christianity, in absolute contrast to ancient paganism and Asia’s religions … not only established a dualism of a man and nature but also insisted that it is God’s will that man exploit nature for his proper ends” (quoted on p. 118). This religious environmental paradigm, as named by anthropologist Poul Pedersen and discussed from a Japanese perspective by Arne Kalland (Kalland, 2008, ‘Det religiøse miljøparadigmet og de Andre’, Norsk Antropologish Tidsskrift 19 (2-3): 94-107), explains a key-opposition in the Shinto environmentalist paradigm, that is “Shinto is reimagined as, essentially, both: a primitive indigenous tradition of ancient ecological knowledge … and a sophisticated holistic Asian wisdom tradition, diametrically opposed to ‘Western’ Christianity” (p. 120-121). The different, overlapping, and sometimes competing re-imaginations of Shinto, which Rots aptly summarizes in Chapter 5 under the five essentialist paradigms (namely imperial, ethnic, universal, local, and spiritual), have indeed occupied much of recent work, and therefore perhaps need not be further discussed in this review (see John Breen and Mark Teeuwen, 2010, A New History of Shinto, Chichester: Wiley-Blackwell ). Rots’ succinct description of each of these narratives that put forward Shinto as more than the historical construct that it is, however, informs the background ideology of many of the contributors to the creation of the sixth paradigm, environmentalist, which may, the author insightfully argues, present the capacity of uniting actors of very different ideologies, precisely because “‘[n]ature and ‘the environment’ are depoliticized, ‘neutral’ topics that provide a common ground on which various Shinto institutions, priests and scholars can find each other—at least when it comes to abstract theory and symbolism” (p. 159). In Chapter 6 we learn that from the 1980s onwards two concurrent scholarly trends significantly contributed to the development of the Shinto environmentalist paradigm. One of the trends is represented by the so-called “spiritual intellectuals,” such as Kamata Tōji, Umehara Takeshi, or Yasuda Yoshinori (previously discussed in the works of Susumu Shimazono, Inken Prohl, and Lisette Gebhardt), who popularized the notion that Shinto is primarily a tradition of nature worship. The second scholarly trend is represented by a mixture of scientists, intellectuals and Shinto priests, who insisted on the association of Shinto with specifically sacred shrines forests and nature conservation. Prominent members of this second trend are architect and urban planner Ueda Atsushi whose 1984 work Chinju no mori can be considered “one of the movement’s foundational texts” (p. 166); ecologist Miyawaki Akira, who promoted the planting of native tree species in the weekly shrine newspaper of the Association of Shinto Shrines (Jinja Honchō) from as early as 1982; Ueda Masaaki, historian specializing in prehistorical East Asia and head of Obata shrine in Kyoto prefecture; and Sonoda Minoru, a scholar of religion and head priest of Chichibu shrine in Saitama prefecture who in 2002 went on to found, with Ueda Masaaki and Ueda Atsushi, the Shasō Gakkai, an “academic-religious non-profit organization that has actively contributed to the establishment of the Shinto environmentalist paradigm” (p. 169). Rots’ critical analysis does not stop with the Japanese scholarly discourse, however, because he reminds readers of Anglophone literature that non-Japanese academics such as Carmen Blacker, John Clammer, Thomas Kasulis and Stuart Picken have all contributed in various degrees to promoting Shinto as “nature spirituality.” This image has been further reinforced among Western audiences by films of Hayao Miyazaki, who in My Neighbor Totoro, depicts a chinju no mori “as the dwelling places of deities, who are strongly connected to (and, for that matter, dependent on) their particular locales” (p. 188). But have these concerns for the preservation of sacred forests been reflected in real advocacy movements? Rots’s transdisciplinary review of the literature reveals that pre-modern preservation responses of shrines forests were not due to an alleged Japanese awareness of any intrinsic sacredness, but instead to increasing deforestation by the authorities and corresponding natural disasters. A similar phenomenon occurred in the early twentieth century when shrine merger policies nearly halved the total number of shrines. Today, Rots duly notes that Jinja Honchō’s expressions of environmentalism are significantly more pronounced in English- than in Japanese-language publications (p. 198), and they often reduce environmental problems to problems of moral and cultural decline (p. 200), rather than to technological and scientific advancements. It becomes interesting, therefore, to know that most of the environmental advocacy efforts are very much localized within certain shrines and dependent “on the involvement and engagement of a handful of active volunteers, not all of whom necessarily identify with Shinto” (p. 204). As in past examples, advocacy today may be too strong of a word for describing actual practices related to the Shinto environmentalist paradigm, but Rots suggests that this may change due to calls for alternative energy following the 2011 nuclear crisis. In the third part of the thesis, Rots delves further into the forest trope, discussing how and why, like in Finland, Germany, and the United States, a discourse claiming an intimate connection between forests and nationhood has arisen in Japan. In Chapter 8, we read that geographer and former president of the International Research Center for Japanese Studies Yasuda Yoshinori argues that “Japanese animism (which he claims is the essence of Japanese religion), is said to have emerged spontaneously out of the forest landscape and monsoon climate of the Japanese isles, whereas the Judeo-Christian ‘monotheistic’ tradition stems from the inhospitable dry climate of the Middle East” (p. 217). These claims, supported by other intellectuals of the Shinto environmentalist paradigm such as Umehara Takeshi and Sonoda Minoru, usually rely on an ecological romanticism focusing on the Jōmon (c.14,000–300 BCE) and Yayoi periods (c. 300 BCE–250 CE), which are seen as the foundational periods of Japanese culture and politics—and, of course, of Shinto (p. 235). To support their arguments, they often refer to what they see as a prime example of prehistoric Japanese religion: Ōmiwa shrine in Nara prefecture, whose sacred object (shintai) is not housed in a honden (central hall) as in the majority of shrines, but consists of Mount Miwa itself, lying just behind the shrine and constituting a sacred shrine forest (chinju no mori). Yet this just seems to be a convenient example (if not even correct: the earliest document to call Mount Miwa a sacred object dates only from 1871), because another shrine, Saitama’s Chichibu shrine, located next to Mount Bukō, also a sacred mountain, has not managed to prevent the mountain from being mined for limestone. 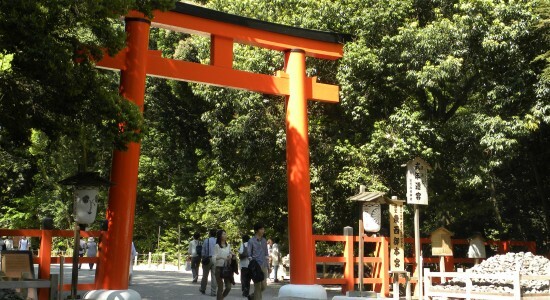 Following these contradictions between intellectual theory and the reality of what are considered to be sacred shrine forests (chinju no mori), Rots uses Chapter 9 to discuss the term chinju no mori itself, noting through the examples of the forests of the Grand Shrine of Ise, of Meiji Shrine in Tokyo, and of the island of Awaji, that even within the same institution (such as Ise), officials may interpret the term differently, from using it to refer to any kind of forest associated with a Shinto shrine to limiting its use to talk of small “natural” forests, where no logging takes place (p. 246). Consequently, as with the Shinto environmental paradigm, Rots argues that the concept of chinju no mori can be employed by different actors for different purposes, as it “carries profound symbolic capital because of its commonly shared discursive connotations” (p. 250). Nevertheless, based on an analysis of a definition of the term, the author shows that chinju no mori usually refers to five core themes: “primordiality and old age; ecological balance and biodiversity; ritual purity and the importance of matsuri (festivals, ritual ceremonies); sacred qualities and divine presence; and continuity with the ancestral past” (p. 259). In the last section of the dissertation, titled “Shrine Forest Stories,” Rots visits and discusses eight case studies of chinju no mori projects, four of which primarily focus on nature conservation itself (Chapter 10), and four of which use the trope of nature conservation to promote the revitalization of cultural practices and/or the nation as a whole (Chapter 11). The projects that the author visits in Chapter 10 are the Tadasu no Mori Foundation entrusted with the conservation of the forest of the same name, owned by UNESCO heritage site, the Shimogamo shrine (Kyoto prefecture); the previously mentioned Shasō Gakkai, founded by prominent intellectuals of the Shinto environmentalist movement, and which organizes a yearly symposium and has published extensively on chinju no mori in various formats; the Sennen no Mori no Kai, founded by the head of Gosho Komataki shrine (Ibaraki prefecture) and “a pioneer in shrine-based environmental activism” (p. 297), whose conservationism goes beyond the forest of the shrine to raise awareness of the local river, warn against overconsumption, and promote rice-planting or traditional charcoal-making activities; the Mori-zukuri Kaigi, a small volunteer group (10 active members) which does forest maintenance work for Shiroyama Hachimangū (Aichi prefecture), but which is not allowed to enter the forested area behind the sanctuary because they are non-clergy. From these case studies several interesting realities arise: we learn that only the wealthiest shrines, such as Shimogamo shrine, can afford to permanently hire people for forest maintenance, while the majority of shrine forests are ignored due to lack of funds (p. 302). Moreover, there seems to be no consensus on the ground about what an ideal shrine forest should look like and what sort of maintenance activities should or should not take place (p. 307), possibly because the existence of a “local community” is imaginary, and in reality, “permanent community involvement is difficult to achieve” (p.310). In Chapter 11, Rots moves on to larger projects, starting with the NPO Hibiki, which organizes its activities in the large forest (160,000 trees) surrounding Meiji shrine in central Tokyo. This forest is described as “the ultimate naturalization project: a politically embedded historical construction and the site of (potentially) contested memories, the shrine was literally dehistoricised by creating an ‘eternal’ and ‘natural’ forest at its site” (p. 315). The author shows how the shrine has been involving a massive number of citizens (as well as non-Japanese) in planting trees in the same way that it asked volunteers from around the nation to plant the trees of the Meiji shrine forest in the early 1900s. The activities of a shrine dedicated to the Meiji emperor and his wife could be conceived as following “a political strategy for socializing participants into the imperial ritual-ideological system, which ultimately served to legitimize the ruling powers” (p. 318). A more contemporary example of cultural education, “religious socialization in disguise” (p. 336), was also observed by the author at another shrine, Kamigamo shrine (Kyoto prefecture), where children invited to participate in a “traditional food culture” event organized by the shrine-associated AFUHI project, had to ritually offer food to the gods, learn about shrine mythology and gratitude to the deities before being allowed to eat. In the final two cases, Rots moves to even larger projects. The first, the shikinen sengū, or the regular (every 20 years) ritualized reconstruction and replacement of all shrine buildings of the Grand Shrine of Ise, has become redefined in the light of contemporary environmentalist discourse as an ecologically sustainable tradition, even though objective reality seems to allude to the contrary: current architectural techniques lead to the quick decay of building materials, and as a result the ritual requires a significant amount of timber to be imported from production forests in Nagano and Gifu prefectures due to the deforestation of the Ise forest itself (p. 343). The consequent cost of this exercise has led the Association of Shinto Shrines to ask member-shrines to buy protective talismans to fund the shikinen sengū, a matter that has drawn some controversy in recent years. Similar costly endeavors are described in the very last section of the dissertation, which deals with reconstruction projects following the triple March 2011 disaster in Northeastern Japan (Tōhoku). One of these projects was set up by the previously mentioned ecologist Miyawaki Akira, whose plan to build a “Great Forest Wall” along 300 kilometers of Tōhoku coast requires the planting of 90 million trees. In this and other projects, Rots demonstrates, with characteristic transdisciplinary zeal, the multiple ways in which intellectuals of the chinju no mori movement “who have praised ‘Great Nature’ (daishizen) for its mysterious benevolence, and Shinto for its unique sense of harmony with and gratitude for nature … find ways to reconcile these idealized notions with the reality of earthquakes, tsunamis and typhoons causing havoc” (p. 362). He optimistically argues that the focus on chinju no mori is possibly only now starting to impact new generations of priests and volunteers who would like to contribute to further improving their local environment beyond cultural-essentialist discourse and grand millenarian schemes. Here, therefore, lies probably the ultimate demonstration of Rots’ argument that a discussion of the sacredness of space needs to take into account the historicity of space (p. 371), one which for Tōhoku has undoubtedly changed dramatically since 2011. The strength of Rots’ dissertation stems, as mentioned above, from the logical reasoning that his transdisciplinary approach offers to his analyses. Rots makes use of a vast amount of sources without getting lost, and consistently knowing what to pick up from which primary resource, interview, or scholarly text. This ability allows him to draw a fascinating picture of the multiple interpretations of concepts such as “sacred forest” or “nature” which make up the core of the discourses that the author has convincingly labeled “Shinto environmentalism.” His study demonstrates how religions react upon, are influenced by, and impact on contemporary social and scientific concerns, thus opening the door to possibly new forms of religious engagement in secular societies, only visible to a transdisciplinary scholarly eye. Sonoda Minoru. 薗田稔. 1998. Dare demo no shintō: Shūkyō no Nihonteki kanōsei誰でもの神道―宗教の日本的可能性. Tokyo: Kōbundō. Miyawaki Akira宮脇昭. 2000. Chinju no mori鎮守の森. Tokyo: Shinchōsha. Ueda Masaaki上田正昭, and Ueda Atsushi上田篤, eds. 2001. Chinju no mori wa yomigaeru: Shasōgaku koto hajime鎮守の森は甦る―社叢学事始. Kyoto: Shibunkaku shuppan. Ueda Masaaki上田正昭, ed. 2004. Tankyū ‘chinju no mori’: Shasōgaku e no shōtai探求「鎮守の森」―社叢学への招待. Tokyo: Heibonsha. Umehara Takeshi梅原猛. 1995 . Mori no shisō ga jinrui o sukuu森の思想が人類を救う. Tokyo: Shōgakukan. University of Oslo. 2013. 416pp. Supervisors: Mark Teeuwen and Terje Stordalen. Image: Tadasu no Mori, the forest of Shimogamo Shrine, Kyoto.